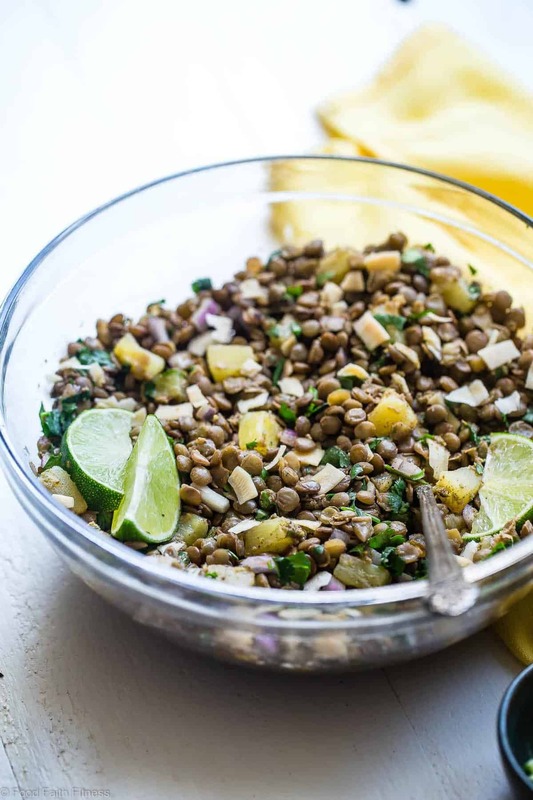 Just wanted to let you know that this tropical, cold lentil salad is sponsored by my friends at USA Pulses & Pulse Canada! Pretending I’m still on a tropical vacay for MAH TASTEBUDS. Like, we’re heading back from the Dominican Republic TODAY and I’m already eating food that makes me feel like I’m back on a white, sandy beach, feeling the ocean breeze WHIPPING THROUGH MY HAIR. Internet BFF’S this CHILLED salad, full of zesty, spicy jalapeno, punchy nutmeg, cinnamon and thyme and sweet bursts of tropical, juicy pineapple with crispy coconut chips? IN. LOVE. So many textures. So many flavors – spicy! Sweet! Savory! – and SO much wholesome, from-the-Earth, plant-based NUTRITION. Plus, it’s gonna make ya feel those toes-in-the-sand-margarita-in-hand vibes. I actually fell in L-O-V-E with the tangy, zesty and sweet-n-spicy flavors of jerk chicken in Jamaica, on a Caribbean cruise that Mr. FFF and I took a few years back, for our first anniversary. There is something about the flavor combo of warm cinnamon and nutmeg, the herby thyme and the vibrant pineapple that just does MAGICAL things as it dances across your taste buds. Like the Caribbean chicken bowls from last year, those crave able, addicting flavor profiles are the base of this bowl of tropical BLISS, buuut we’re switching up the protein for the plant-powerhouse that are PULSES. <– Specifically, lentils! Do you eat pulses? Do you know what they are? 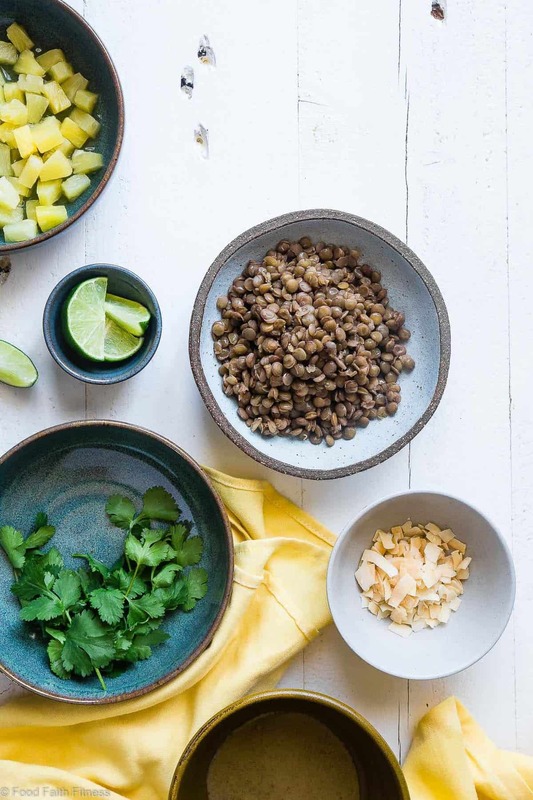 These tasty little gems are the delicious, protein-packed, sustainable foods known as dry peas, chickpeas, beans and, as we’re usin’ today, LENTILS! 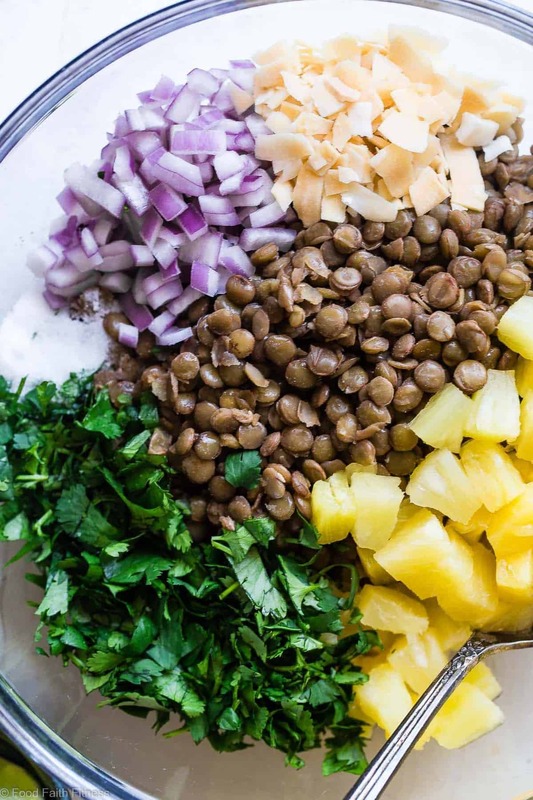 There are roughly 8 grams of protein in a half cup of cooked lentils, which – SPOILER ALERT- just so happens to be a serving size of this easy-breezy-tropical cold lentil salad recipe. If you’re reading this which, ummm, YOU ARE, I can almost 100% guarantee that you’re looking for SUPER EASY, ATTAINBLE ways to eat little healthier. Adopting the “Half-Cup Habit” is JUST THAT. Just add ½ cup of pulses to your diet 3x per week and VOILA – more nutrients AND plant-based protein! They’re PACKED with fiber which helps with digestion! Because they’re packed with fiber and complex carbs, they give you steady, slow-burning energy to get you through your day! 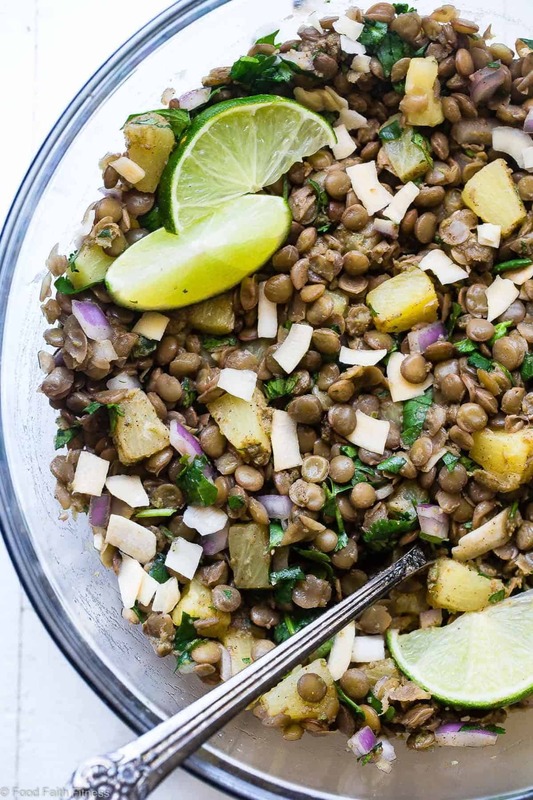 Don’t mind me, just gonna sit here and eat this lentil salad ALL WEEK LONG. The super-cool-and-exciting things about this salad (aside from that fact that it’s scoring some MAJOR yummy points) is that it’s BEST if you make it ahead and it’s SUPPOSED to be cold. So, ummm, it’s the greatest thing EVER for wanna-bring-healthy-lunches-to-work-that-keep-you-full-until-dinner Y-O-U. Meal prep WINNER! It’s also the kind of salad that MEN EAT. WITHOUT complaining. <– Mr. FFF is NOT a salad inclusivist and he HAPPILY ate leftovers for dinner and even asked if he could experience the tongue-tingling, spicy-sweet jerk-inspired salad goodness in his lunch the next day. 1-2 Large jalapenos, roughly chopped, to desired spiciness. Rinse the lentils and stir together the water and lentils in a medium pot and bring to a boil. Once boiling, turn the heat to medium-low, cover and cook until tender, about 15-20 minutes. Drain well and add into a large bowl. Add all the other salad ingredients, except the coconut chips, into the bowl and stir to combine. In a SMALL food processor (mine is 3 cups) process all of the dressing ingredients until the jalapeno is broken down and the dressing is smooth, stopping to scrape down the sides as necessary. Pour the dressing over the lentils and mix well. 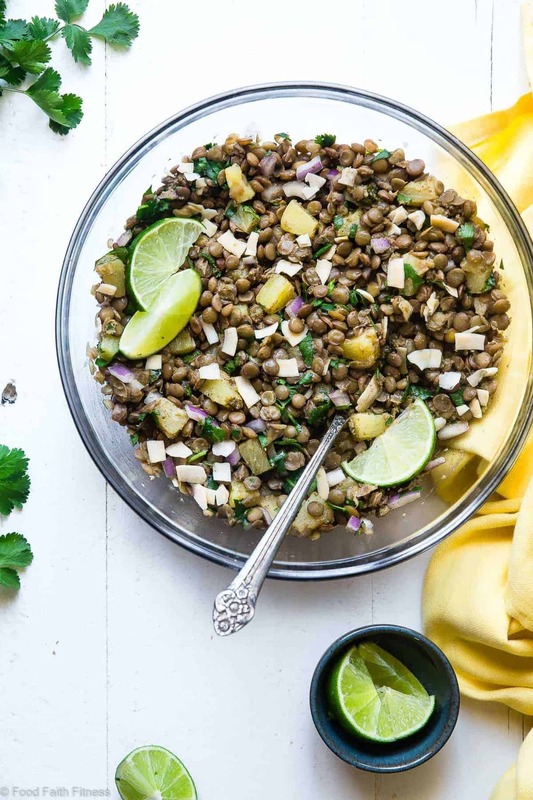 Cover and refrigerate at least 2 hours up to overnight so the lentils can absorb the dressing and develop flavor. When ready to serve, stir in the coconut chips* and DEVOUR! * You want to add these before serving, so they stay crunchy! THIS POST IS SPONSORED BY MY FRIENDS AT USA PULSES & PULSE CANADA. THANK YOU FOR ALLOWING ME TO CONTINUE CREATING GREAT CONTENT FOR YOU BY SUPPORTING PARTNERSHIPS WITH SUPER-FAB BRANDS THAT FOOD FAITH FITNESS LOVES TO WORK WITH! AS ALWAYS, OPINIONS REMAIN 100% MY OWN! Sign up for the Half-Cup Habit, and see how easy it can be to add ½ cup serving of pulses to your diet! This sounds so flavorful—love that you used pineapple in a salad. Perfect packed lunch! I don’t think I’ve ever seen Caribbean flavors fused with lentils. How unique and fresh! Such a healthy salad packed with nutrition, fiber, and flavor! Loving the addition of pineapple, so different. This looks so delicious!! 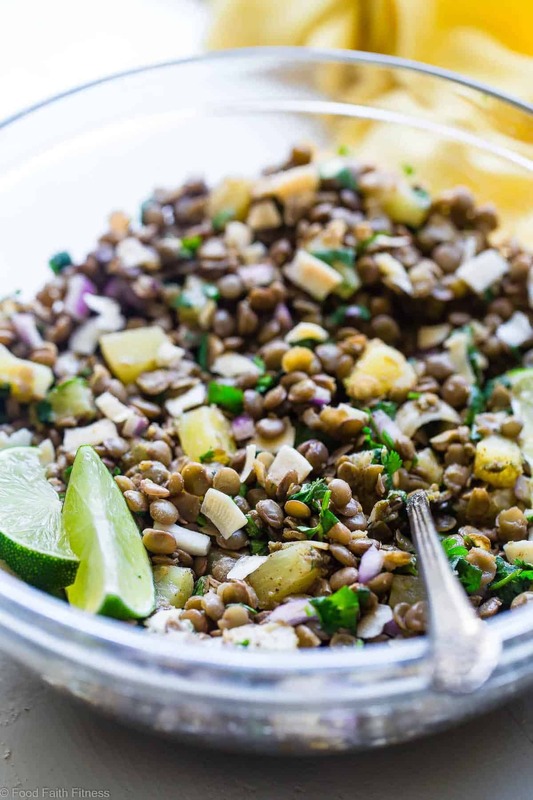 I love lentil salads, especially during summer. This one sounds perfect for the upcoming warm temps! It’s a great spring and summer dish! It also packs well for road trips and picnics. 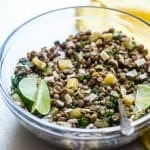 Lentils with a tropical personality, I LOVE it! Sometimes we all need a little taste of the tropics, no? This is absolutely gorgeous. Yay for lentils!! Refreshing! This one’s a keeper! Thank you.